Want the freedom to place USB devices anywhere in a room? Imagine putting your scanner on a shelf behind you, your printer in a cabinet, and your camera, well, anywhere. Sick of cabling up your laptop to multiple devices? Now you can plug in a single USB “key” and connect wirelessly, at an amazing 480Mbps, to all your USB devices. Sounds like the ultimate pitch. In many ways, it is. 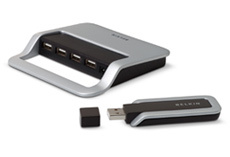 According to Belkin, this hub, utilizing Ultra-Wideband (UWB) technology with the Wisair chipset, allows you to place your laptop anywhere in the room so you can print, play music, scan, download photos, and burn CDs from anywhere in the room. Keep in mind that real-world performance often is about 40% of the advertised throughput, and it remains to be seen if the topology of the device requires all USB “destination” devices to be cabled to the hub, or whether individual devices as well as computers can be interconnected via the wireless dongles. Maybe I’ll find one under the Christmas tree. Yeah, but has Mista C been a good boy this year? If the traditional weighing of merit is employed, I’m thinking you can expect a lump of coal! I’ve been true to myself, and I haven’t INTENTIONALLY screwed over anyone. That’s gotta count for something. Flavored coal?